WEDDING PHOTOGRAPHY - KEEP IT FUN! Here is what the wedding photography world is saying...KEEP IT FUN! Here are some wedding photography tips for your upcoming intimate wedding. 1. No longer as the posed photos of the past. Nowadays, a good photographer will deliver 70-80% candid shots and the rest posed where naturally or assisted. 2. Smoke bombs. How fun are these? You can buy in many colors to add another layer to your wedding photos. 3. First look - many couples want us to capture their "first look". Even with elopements, couples are choosing to arrive separately and keep it traditional...the groom does not see the bride until the ceremony and we are here to capture that first look. 4. Props - with the advent of crafting becoming so ever popular in the wedding industry, many couples are bringing their own wedding props, in form of signage, flowers, baby photos, mirrors, etc. 5. Maintain a good sense of humor - A good photographer will capture your good humor or a lack of. During the post-ceremony photos, most couples are tired and want to keep the photo session short. If you are tired, it will show in the photos. Get a good night's rest, keep drinking alcohol to a minimum and keep that sense of humor until the end of the session. Afterall, you will only be doing it once. Right? 6. Dramatic backgrounds - some couples are so much fun that they don't mind going out of their way to be photographed in out-of-the-way places. As a photographer, my mind is always searching for new locations and cubby holes mix it up a bit. Some couples will even stand in a creek upon mine suggestion. Some brides will even trash their dress since they will be wearing it once. I love photographing couples by pilings under a pier or a cool bluff with spectacular views. Think creative or at least follow your photographers lead for unusual backdrops and make it fun. 7. Social media is king! Forget the old fashion albums. I don't even know if they are still selling them boxy things. Use social media to share your photos. Use every social media avenue that you are familiar with for sharing your photos. The great news is that you can share as many photos as you want all at once to as many people you want. Love social media! 8. Creative suggestions - I love when couples bring their own creative suggestions. If you have a vision for your weddings photos, by all means, email them to your photographer. I have so much fun creating and executing your vision. 9. Wedding collage - I usually try to get a wedding collage to the couple within 24 hours. They are great to use as a wedding announcement and as a teaser of more to come. 10. Wear a veil if you can. Nothing says WOW like a wedding veil. It makesforgreat wedding photos, especially when draped over both of you. So let's keep the photo session fun, relax and let's keep it real! I found this article from Wedding Bee. You might find it very helpful...almost as helpful as me. Just food for thought. Okay, first of all, I cannot exaggerate enough how important it is to trust your wedding planner (me). After all, you are entrusting your big day to a stranger. After meeting me, all that goes away and we become like family. Nonetheless, you have to trust your wedding planner to come through with all her promises. It's important that you fully read your contract and you and your planner are on the same page (no pun intended). If it is an beach or outdoor wedding, your planner will make suggestions for a plan B. Nowadays, mother nature is all over the place. At best, your wedding will be perfect (which is most of the time). Back to the trust issue. Rely on your planner to help you through the planning process as she can guide you from the very beginning to end. As your planner, I will discuss the weather, venues, accommodations, color palette, wedding dress options, flowers, reception, and even your bridal emergency kit. To wrap it up, from the first communication to your wedding day, my work is not done until I walk with a smile on my face. On A Budget For Your Wedding & Reception Flora...Here's the Answer! If you are on a tight-as-a-drum budget for your wedding flora because you splurged on your wedding dress, don't despair! Greenery garlands are taking weddings and tables by storm in 2017. Wire them together, place them on the table, add some votive candles, PRESTO! you are done!!! Easy on the wallet. I love using eucalyptus greenery. The most common are the silver dollar eucalyptus. They are pretty and soft in the presentation. There are so many varieties of greens to choose from. You can even mix them to make a statement. Lemon greens greenery are beautiful for the deep green hue. Olive garlands are gorgeous for their soft grayish hue. Go to your local farmer's market for your greens. Michael's Craft store is great for the green floral wire, votive candles, and ribbon. 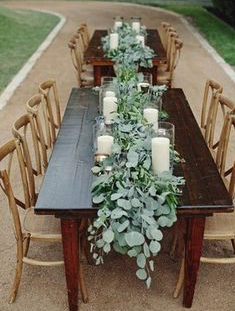 Check out new Table For Two Wedding Package with plenty of silver dollar eucalyptus. Don't forget to call me for your Santa Barbara elopement wedding needs. I was surfing the web for DIY wedding ideas for your reception/dinner and found these great ideas OH BEST DAY EVER. To make these Rosemary Wreath Place Cards follow this link. Plus there offer plenty of other of DIY ideas for your wedding. Even if you are just having cake and champagne after your beach wedding, you can still make still make these for your guests. They would love the personalized touch! The reason you are eloping is because of the thought of a big wedding is scary and costly. Elopements are easy, personal and romantic. But don't let it stop there. By easy, I mean you can take your elopement wedding planning one step further...choose an all-inclusive elopement wedding package that is perfect for you. Santa Barbara elopement packages work well because it takes the guess work out of elopement wedding planning. You can even customize your own elopement wedding package to include photography, stunning bridal bouquet and boutonniere, floral centerpieces, customized ceremony, arbor or arch set up, indoor or outdoor ceremony, reception and so much more. All the luxuries of a large wedding! Our Santa Barbara elopement all-inclusive packages offer make it super easy on you and your wallet. Just pick a date and time and AlmaRose will do the rest so all you have to do is say I DO! So, before you elope to Santa Barbara, call me and then you can relax. Wow, what a great 2917 beginning for Wedding For Two. The phone is ringing, the emails are coming and seems like there is a freshness of love in the air. I feel so blessed to have so many couples entrust their Santa Barbara elopement coordinating and capture their special day in way of photo memories. As we approach spring, the winter rain will make for stunning colorful outdoor backdrops for your elopement. So many prospective venues and options to choose from. The Santa Barbara Historic Courthouse still remains one of couple's favorite venue as it offers so many indoor photo opps along with the sunken gardens and the back end of the courthouse. Can't wait for spring! I know Santa Barbara well and are familiar with so many venues for just the two of you. Some are unexpected and I utilize our beautiful Santa Barbara architecture to bring beauty to your photo memories. Toes in the sand elopements are still one of couple's favorites. Sandy Beach Cove is one of my favorites as it offers secluded coves and dramatic backdrops. Tell me you vision and I will steer you to the perfect venue for our Santa Barbara Destination elopement.